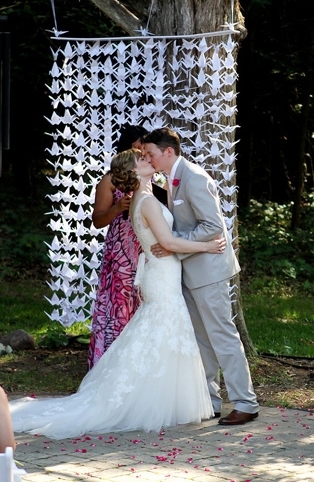 10 Sensational Wedding Backdrop Ideas! Forget the traditional arch, these days, anything can become a beautiful backdrop to your wedding ceremony. Old barn doors, colorful streamers and DIY cranes are all ways to dress up your “I dos.” If you’re looking for a creative decor idea, browse 10 stylish backdrop options below. This backdrop was inspired by Disney’s “Up”!